If you need to modify or cancel an existing subscription to Athletic+ or Team Supporter, you can do so quickly and easily. See the following instructions depending upon which kind of subscription you'd like to modify or cancel. You can also change your payment card with these instructions. Athletic+ subscriptions can be changed from monthly billing to yearly billing, from yearly billing to monthly billing, or cancel your subscription entirely. 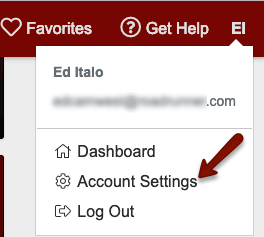 To modify your subscription, click on your initials or picture in the top right corner, and then click  Account Settings. From the row of choices across the top of the page, choose  Subscriptions. Scroll down to the Athletic+ section, and click Modify Subscription.  Change Card: Change the credit card that your subscription is being charged to.  Switch to Monthly/Yearly Subscription: Change your subscription plan to either a yearly or monthly plan. When you change subscription plans, you won't be charged under the new plan until your current plan expires. In other words, if you change from yearly to monthly, you won't be charged for the first month until a full year has elapsed since the date of your original yearly subscription. If you change from monthly to yearly, you won't be charged for the year until your next monthly charge would have taken place.  Cancel Subscription: We'll be sorry to see you go, but we understand. If you cancel your subscription, you'll enjoy the benefits of Athletic+ membership until the end of your last fully-paid billing period. In other words, if you cancel a yearly subscription after eight months, you'll still enjoy Athletic+ membership benefits for the remainder of the year.